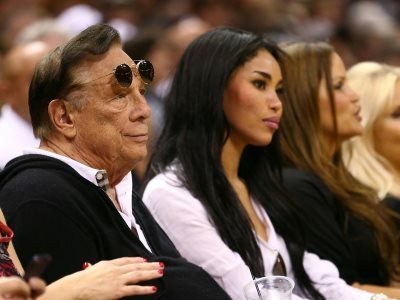 AFRICANGLOBE – Corporate sponsors started to distance themselves from the Los Angeles Clippers Monday after a tape surfaced over the weekend of the team’s owner Donald Sterling making racist remarks. In a statement released Monday, Carmax, a used car chain, confirmed it would cut ties with the team, ending a nine-year partnership. Virgin America confirmed that it would end its sponsorship with the Clippers, noting that the company continues to “support the fans and the players.” A Mercedes-Benz spokeswoman wrote in an email that the company “has moved to cease its sponsorship of the Clippers effective immediately.” Chumash Casino Resort told Businessweek it was “withdrawing [its] sponsorship” of the team. Corona, insurance giant State Farm, carmaker Kia, AQUAhydrate, a company that sells enhanced water, energy drink company Red Bull, Sprint and Lumber Liquidators, a hardwood flooring company, are all reportedly suspending their sponsorships with the team. LoanMart, an auto title loan company, also wrote on its Facebook page that it’s suspending its advertising and marketing relationship with the Clippers and monitoring the situation. In addition, Yokohama Tire Corporation is suspending its sponsorship, company announced in a statement. Late Monday, Samsung also announced it had decided to suspend its advertising campaign both at Clippers games and on TV while the Clippers play, according to Businessweek. CarMax’s decision just hours after Steve Stoute, the CEO of marketing firm Translation, which represents State Farm, told ESPN radio that the insurance giant will be pulling its sponsorship as well. When directly asked by ESPN radio host Colin Cowherd whether State Farm would be pulling its sponsorship, Stoute said yes and said he expects other brands to pull out in the next 48 hours. State Farm hasn’t responded to multiple requests for comment asking about the company’s status with the Clippers. In a statement released, State Farm said that the company will “pause” its relationship with the Clippers while “those involved sort out the facts.” The company still plans to work with Clippers star Chris Paul. After initially saying it would review its sponsorship agreement with the Clippers, Corona decided to suspend its sponsorship agreement with the Clippers until the NBA completes its investigation, Corona spokeswoman Emily Reynolds wrote in a statement. A spokeswoman from AQUAhydrate, another Clippers sponsor, wrote in an email statement that “In the wake of Donald Sterling’s alleged defamatory and intolerable comments” the company would “suspend” its sponsorship with the Clippers until the NBA completes its investigation. Sprint is doing the same, the company wrote in an email. Kia is also suspending its sponsorship with the Clippers, according to a a statement released. Red Bull is also “suspending” team marketing activities with the Clippers, while the NBA investigates Sterling’s alleged statements, according to a statement the company released to BuzzFeed. Red Bull still plans to “support” Clippers player Blake Griffin. Steve Kulm, an Amtrak spokesman, wrote in an email that the firm’s sponsorship with the Clippers ended a few weeks ago at the end of the team’s regular season. Though some of its sponsored advertising is still in the market the company is “diligently working to remove all sponsorship assets” and will monitor the situation as they look to make decisions for the 2014-15 season. “Amtrak believes the language used is unacceptable and is inconsistent with our corporate belief to treat everyone with integrity and dignity,” Kulm wrote. The Rev. Al Sharpton, an activist and MSNBC host, vowed Monday to pressure companies that work with the team and the NBA to cut ties until the league rids itself of Sterling. NBA sponsor Anheuser-Busch wrote in an email statement that they “fully support the NBA’s efforts” to quickly investigate Sterling’s remarks. The company’s last sponsorship deal with the Clippers ended in 2009. TMZ released an audio recording surfaced late Friday of a man believed to be Sterling instructing his then-mistress not to bring Black people to Clippers games. The recording, which went viral within a view hours, sparked outrage across the country, eliciting responses from NBA legend Michael Jordan, Miami Heat Star LeBron James,the Clippers themselves and even President Obama.